Today when we honor the many people who have given so much for the freedoms we revere, I want to talk about a lesser-known patriot who arrived at the right time and did what needed to be done to help then General Washington save the Continental Army during the terrible winter the Army spent at Valley Forge in 1777-78. We can learn some valuable lessons in sales leadership from 1778. This leader’s methods were all new to the Army, and his approaches to supporting, training, coaching, documenting and leading are still relevant today to those of us confronting the daunting task of reforming a stalled sales/marketing organization. Friedrich Wilhelm Ludolf Gerhard Augustin von Steuben arrived in Valley Forge in February of 1778. He was a German-Prussian Aristocrat army officer (or at least he said he was, some historians question his claimed background). He was introduced to Washington and the Congress by Benjamin Franklin, then in France. Franklin recognized the operational excellence and iron discipline in von Steuben that the Continental Army so desperately needed, so he overlooked certain detail of the Baron’s past and lied cheerfully about his credentials. Washington probably know Franklin was lying, but he also saw in von Stueben the man they needed now to train the Army, so he persuaded Congress to appoint von Steuben to the post of Inspector General. Despite the language barrier, von Steuben set to work writing a standard manual for the Army, which was translated from French to English. This text entitled “Regulation for the Order and Discipline of the Troops of the United States” or “Blue Book” was the standard manual for the Army until just before the Civil War. 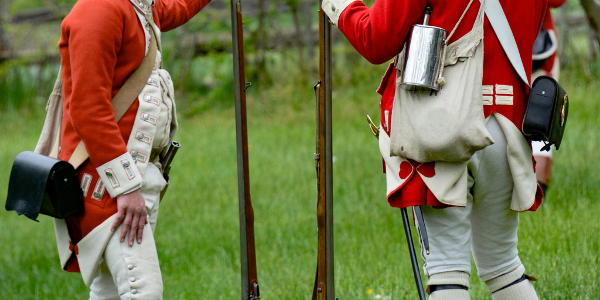 The Continental Regulars were a different group of soldiers when they marched out of the Valley in the Summer of 1778. In subsequent meetings with the British they gave a much better accounting of themselves, leading to the Battle of Monmouth which most historians called a draw. For the British Army, a draw was a disaster; they were used to routing the American Army at their leisure. The realization came that the Continental Regulars had improved, while the British Forces had stayed the same. This certainly influenced the final outcome of the war. He made training and coaching far too important to be left to Sergeants who were themselves not trained. Coaching was done at a personal level with immediate feedback. This was unheard of in the American Army. Officers did not drill troops. Later in that year von Steuben informed the officer corps that they would be responsible for drilling their own commands. A furious group of senior officers descended on Washington’s quarters, where they were told in short terms by the Commander in Chief that von Steuben’s suggestions were his orders. His language limitation notwithstanding, von Steuben forged processes and documented them where neither had existed before. The work was so thorough and appropriate that it survived for decades. He wasn’t trying to get the troops to like him, far from it. They liked him anyway because he sincerely cared about their welfare and showed it at every step. This is leadership. Von Steuben didn’t care that “it isn’t done this way”. Hard work was not beneath him. He took the time and trouble to overcome obstacles, correct institutionalized malfunction, create new ways of doing things and then document how things are done. He did not just do those things that were in his comfort zone, or politically safe, he did what needed to be done to make the Continental Army effective at its job. Assembling and leading an effective Sales/Marketing organization in a competitive environment is very difficult. We confront the same issues Baron von Steuben did. When we start believing that it’s all too hard, and there must be an easier, way, we should remember what an aging German Soldier was able to do in a frozen valley a long time ago, and press on. It’s worth it.